So allow me to remedy that. Today I want to be very honest about all the aspects of parenting that I am a total failure at. I hate feeling like I`m not cutting the mustard when it comes to mummy-hood, so I try my best to grin and bear these things and act as though I`m enjoying them...but just the sheer amount of hatred I have for them makes me feel like a terrible mother in itself and brings all of that good old mummy-guilt flooding down on me! And I can't even drown my sorrows in gin coz I'm pregnant...marvellous! 1. I HATE THE PARK!!!!!!! Like...I really, REALLY hate it. My 2 year old son, bless his heart, thinks that the many parks around where we live are some kind of heavenly Mecca for small children - there are sandpits, swings, all manner of things to crawl though, and fresh air aplenty - what's not to love?! Well I'll tell you what's not to love...there are sandpits (Hello sand in my shoes without the fun of sunbathing on the beach), there are swings (for me to worry about him running past while some maniac child is apparently trying to touch the sun with his toes), there are all manner of things to crawl through (those new expensive Next jeans I just bought you are not made for that!) and there's fresh air aplenty (OVER RATED BORING FRESH AIR! THERE...I said it! I think fresh air is OVERATED AND DULL! ). There's also a deplorable lack of benches for exhausted pregnant mothers like me to sit on, too many other kids flailing about and making me panic, and ...well...for gods sake I just like my nice warm cosy house, I'm not into all of this outside malarkey - its cold, and its boring, and I want to go home. Ok?! Now this one makes me feel like possibly the worlds worst mother, every time my little boys ever-so-sweet voice beckons out "Mummy, do you want to play with me?" I fear that deep down he knows the answer. But the thing is...it's just SO much effort. He loves to play with playsets and little characters, but he is ever so bossy and I never get to be any character that I want to be...I always have to be "The baddy" and I always have to do and say exactly what he wants me to - so why do I even need to be there at all?! I'm just like some kind of Playmobil-wielding slave to his every command. Plus he never wants to play up on the sofa where its comfortable, it's always on the floor and my pregnant hip-pain suffering self really doesn't find that so easy to do these days! 3. I REALLY REALLY HATE CRAFTING! I so wish I was one of those perfect Pinterest mums who could spend ages crafting and making beautiful keepsakes that will be treasured for years to come whilst whiling away the hours chatting and giggling with my child as we happily paint, sew and stick together. But the reality is...just lots and lots of mess. I hate sticky fingers (Mine or anyone elses!). My son, bless him, watches a lot of crafting videos on YouTube and now regularly asks me "Will you craft with me Mummy? Like the Mummies on YouTube do? ".....AAAAARGH THE GUILT! I could go on and on about my parenting fails, but let's face it...it's just making me feel bad! So I'll leave it here for now and save the rest (and ohhh there are many!) for another day! 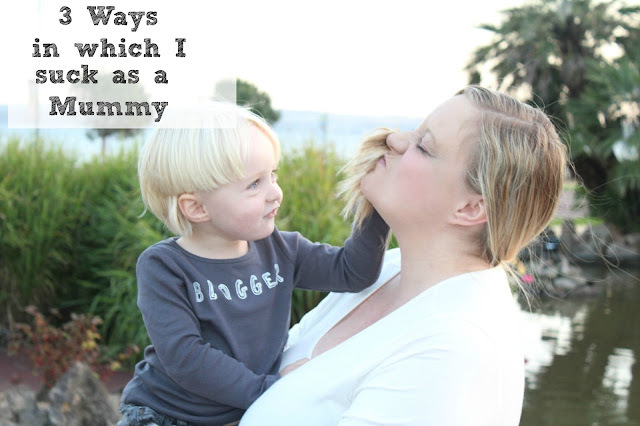 What do you consider to be your parenting fails and do they make you feel as guilty as I do?! Please share with me, and let me know I`m not the only one! I love this post - I think so many women think they're bad mums at times, it's refreshing to actually see it written out there! My boy is 2 months, sometimes I feel I try and manipulate him to sleep too often, even when he's not tired, so that I can do my long list of chores! Then I feel bad that I should be playing with him and feel like a horrible mum! I think the Pinterest mums are in the minority but they still manage to make us all feel bad. I'm ok with the park but am terrified of the playground - he's mad for climbing the highest things and I'm afraid of heights which makes chasing my 19 month old up things which terrify me. Not fun! Oh I am with you on the crafting. However the park is great, it is just two mins from my house and it has a nice bench. Therefore I take a coffee and grab five mins peace whilst she plays! I don't do crafting or baking with them and I hate tidying up their toys so it rarely gets done. I am grest at getting out with them but my poor house gets neglected because of it. I am so far from a pinterest mum! yeah! We have so much in common lol! I cant stand most crafts. It really does depend on what im doing but in general, it's not something i like or really want to blog about. Well done for a great honest post. I am with you on this. It is not the fact that you get your hands sticky when crafting, I just don't have the patience to sit down and do something or I never have any ideas to come up with. I am glad he gets to do this plenty of time in his creche though. We rarely go to the park. I can count on my fingers how many times we went to this year. But it is also mainly because of Chloe as she has 2 naps during the day and I prefer her having them at home properly as she wakes from ANYTHING. Ha ha, I still love peeling off PVA glue, but now we stick to UHU glue pens. Much less mess. Thankfully nursery did the messy stuff with N. He's not really that keen on crafting.